Bruce Snyder, Jr., MBA is an IU graduate with a B.S. in Public Affairs. In 1992, he attained his Masters of Business Administration (MBA) in finance, graduating with high honors. He was inducted into the Delta Mu Delta National Honor Society in Business Administration. Bruce currently serves as Vice President of the Friends of Hamilton County Parks. He has written numerous articles on financial planning for the Indianapolis Star. He is a member of the Carmel Chamber of Commerce. Bruce is a Registered Representative thru First Heartland Capital, Inc., Member FINRA and SIPC, and an Investment Advisor Representative thru First Heartland Consultants, Inc. He has been on the FHCP board since 2006. Judith Campbell, born and raised in Indianapolis, has lived in Hamilton County since 1971. She received her MD degree from the IU School of Medicine and went on to practice child and adolescent psychiatry until retirement. As a child, she spent much of her time out of doors, and her parents took her to parks across Indiana and nearly all National Parks. She instilled this same love of nature and the outdoors in her own children and grandchildren. Dr. Campbell is a founder of Chaucie’s Place, a child advocacy organization in Hamilton County focusing on the prevention of child sexual abuse and youth suicide. Dr. Campbell has served on the Friends of Hamilton County Parks board since 2006. Along with serving on the FHCP Board, Dr. Campbell is on the board of the Legacy Fund and the Hamilton County Parks Board. Her passions include parks, green space, and the health of children. Ryan grew up in the Midwest and moved to Carmel in 2007. He has an undergraduate degree in business from U Wisconsin and did his graduate work at the U Texas, Austin, School of Business. Since graduate school, he has worked in the finance and investment field. In 2007, Ryan started Fuhrmann Capital, where he manages money for individuals. Locally, he is involved in investing and venture cap/entrepreneurship and enjoys spending time at the Speak Easy Office where local entrepreneurs tend to gather. Ryan has an 8 year old daughter and 6 year old son as well as 2 dogs, 2 turtles and 1 cat. He has fond memories of spending time out of doors as a child, swimming, fishing and catching monarch butterflies in rural Kansas and the suburbs of Milwaukee. He is active in the community, serving as treasurer on the Porche Club , treasurer of the International School PTO, the board of Shepherd’s Center of Hamilton County, and the Eiteljorg Museum Board of Advisors. Ryan has been on the FHCP board since 2016. Muniver K Singh has lived in Noblesville since 1993. Her husband, Indi Singh, attended Noblesville high school and was part of Noblesville community since 1970. Muniver earned her MD while living in India and Physician Assistant degree from Butler. For the first 12 years of their marriange, Muniver and Indi lived on a farm and left her very passionate about nature and outdoors. She took her boys to Forest park and Dillon park on regular basis and have fond memories of the carousel in the park and sledding down the hill at forest park. She owns a small business in Noblesville. Jill Sweet Mead, daughter of Acorn Farm Camp founders, Herb and Dee Sweet, grew up and raised a family in Hamilton County. She and her husband, Mic, call Acorn Farm home. From her experiences at her parents’ and other camp programs, Jill (who has a degree from Purdue in Child Development and Family Life) knows how important it is to provide opportunities for young people to explore and learn firsthand about the natural world around us. She and Mic have managed most of the camp’s forty acres as a nature preserve—much as it has been since 1934, when the Sweets bought the property. Jill hopes to help Hamilton County Parks to expand current programs by developing extended and in-depth programs using the old camp, allowing young people to experience some of the same good times campers did in previous generations. Jill has been on the FHCP board since 2013. Allen started in the Parks and Rec world as the Parks Director for City of Connersville, Indiana. He joined Hamilton County Parks and Recreation in 1992. Under Allen’s leadership Hamilton County’s park system has grown from 191 to 1,650 acres. In 2006, Allen was recognized by the Indiana Park and Recreation Association’s as its Outstanding Professional. He and the Hamilton County Parks and Recreation department have been recognized as leaders locally and nationally. Allen has served as President of the Indiana Park and Recreation Foundation. 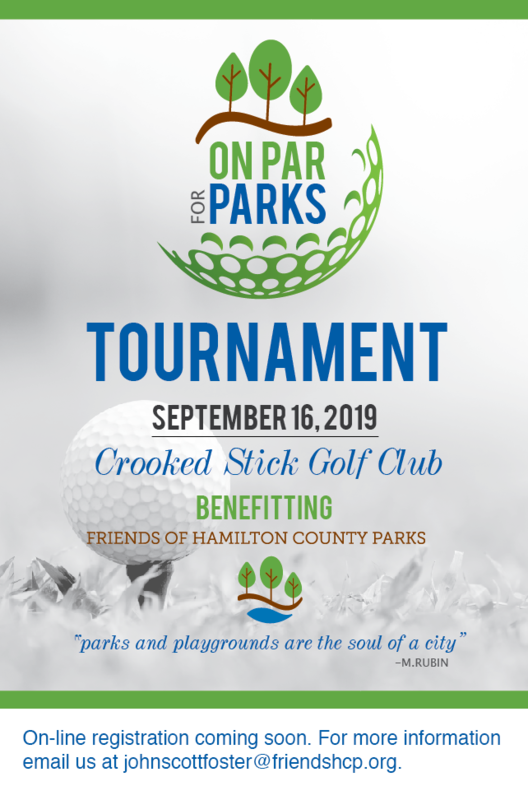 He is determined to help build the Friends of Hamilton County Parks into a foundation that will ensure the care of existing parks, and future development of the Hamilton County Park and Recreation Department. Lisa Brenner Allen was born in Indiana and went to school at Butler University. Lisa has been married for 34 years to husband Cliff and has two children—a son, Cale, who lives in Denver, and a daughter, Peyton, who lives in D.C. Lisa was the Director of Sales & Marketing at the Builders Association of Greater Indianapolis, organized Home-a-Rama for over 10 years, and was the first Executive Director of the Hamilton Southeastern Schools Foundation. Her hobbies include yoga, golf, gardening and photography. Lisa has always enjoyed the outdoors, and growing up, went on long hikes with her dog in the woods next door. Parks are important as the center of community: they provide mental health boost, physical activity for both adults and children, and protect natural ecosystems. Jan DeJarnatt has a B.S. in Education from Indiana State University and an M.S. in Education from Indiana University. Jan has lived in Hamilton County for almost 40 years. She was an educator for Noblesville Schools. She developed and taught the Science Club & Fair and Computer Club for Forest Hill Elementary and the Nature Center Program for Noblesville Schools. Upon retirement, Jan became active in Hamilton County Retired Teachers (President), Sigma Kappa Alumni Indianapolis (President), Hamilton County Park Board, Indianapolis Panhellenic Association, Delta Kappa Educational Society (President), and Riverview Hospital. In 2015, she was honored with a Volunteer of the Year Award from Indiana State Retired Teachers. Jan is the wife of Doug, mother of Susan, and grandmother to Jeremiah & Jermon. She enjoys helping in Susan’s classroom, going on field trips with her grandchildren, volunteering at Riverview Hospital and with the Hamilton County Parks and Recreation. Todd Irwin is co-founder and CEO of BlueSky Technology Partners, Inc., an eCommerce consulting firm with global headquarters in Noblesville, IN. Under Mr. Irwin’s leadership BlueSky has built a trusted consultancy with global service delivery in the United States, Canada and India. BlueSky is well known for implementing market leading multi-channel commerce platforms and for optimizing key performance metrics with world-class digital marketing methods under the BlueSky Digital business unit. BlueSky has developed enterprise b2c and b2b solutions for numerous well known brands in the retail, manufacturing (consumer product goods), distribution, financial services and life sciences industry segments. BlueSky annually receives awards for being “a great place to work” and has supported numerous charities and philanthropic activities within the company’s BlueSky Cares initiative. Mr. Irwin lives in Westfield, IN, with his wife, Chris, and two boys, Pete and Will. Mr. Irwin has spent numerous years coaching youth sports in Westfield and he’s an avid outdoorsman that loves to spend time fishing and golfing. Dan was born and raised on the south side of Indianapolis, the youngest of seven siblings. After attending Roncalli High School, Dan went on to Xavier University to earn a bachelor’s degree in Sociology. Following college, Dan spent 4.5 years in the United States Air Force, where he served as an engineering technician at Scott AFB, IL. When Dan returned home from the service, he implemented the skills he learned in the military and acquired a job in the local construction industry. He later obtained his MBA in 2006 through Indiana Wesleyan. Dan is currently a Sr. Business Development Manager for Meyer Najem Construction Company in Fishers. He will be married to his beautiful wife Jeana for 20 years this year, and is the proud father of two daughters, Lexi (18) and Sophia (13). Jennifer Roberts, a civil engineer trained at Purdue University, is founder of ELEMENTS Engineering, a civil engineering design firm focused on sustainable solutions for site development. She has designed many green infrastructure projects in Indiana and has helped to educate her clients on the benefits of designing with nature. Jennifer is an advocate for conservation, primarily due to her exposure to nature as a child growing up surrounded by Hoosier National Forest in Southern Indiana. Although she’s grown milkweed for over 10 years, it wasn’t until the summer of 2017 when she discovered the joy of raising monarch butterflies indoors. Her favorite sport is networking, with road cycling a close second. Susan Shelley was born and raised in Philadelphia and graduated from St. Joseph’s University. She worked in sales and marketing until 2009, and then served as Executive Producer of the nationally syndicated PBS series “Built to Last” featuring new and retrofit construction projects. She founded a business development firm, Three LB Development which provides business development to a variety of national and regional manufacturers. Susan also serves as Business Manager for the Chief Architect of Residential Technology for the Department of Energy. Susan has one son, Ryan, who works in Palo Alto as a Mechanical Engineer. Her oldest daughter, Mackenzie, works for a startup in NWI, and her youngest, Maria, is pursuing a Pharm D degree from Purdue. Susan moved to the Village of West Clay in fall of 2017. She enjoys hiking mountains, racquetball, and entertaining. John S. Terry obtained his undergraduate degree from Wabash College in 1995 and his law degree from Indiana University in 1998. Mr. Terry was admitted to the bar in Indiana in 1998. He advises business men and women and their companies and families through the day-to-day and long-term challenges which they may encounter. Mr. Terry has since been active in the community. He is a past president of the Hamilton County Bar Association as well as a member of the State Bar Association. He also serves on the boards of the Actors Theatre of Indiana and the Legacy Fund. He as been on the FHCP board since 2015. Sharon Terry has lived in Carmel since 1971. She graduated in 1959 as a Registered Nurse from the St. Vincent School of Nursing in Indianapolis. While raising four sons, she served on various PTO boards with terms as President of the Carmel Elementary PTO and as President of the Carmel High School PTO. In 1979, she was elected to the Carmel Clay School Board and served eight years, one as the board’s President. She and her husband moved in 2002 to Carmel’s Village of West Clay, where she became a member and longtime Chairwoman of the Village’s Social Committee. Sharon joined FHCP in 2005. She founded the Coxhall Gardens Women’s Guild and serves as its Chairwoman. Sharon has been on the FHCP board since 2006. John Scott Foster was born and raised in Norfolk, Virginia, claiming his mother’s side of the family—the Hunnicutts—who were some of the first to step onto shore in Jamestown more than 400 years ago. He earned a BS in biology at VaTech, and pursued a Masters in Zoology and a Ph.D. in Science Education/Museum Studies at University of Florida. For most of his career, he worked in the conservation education field at nature centers or zoos in Georgia, Illinois, Indiana and New York State. Prior to becoming the executive director of the Friends of Hamilton County Parks, Dr. Foster was the executive director of Wesselman Nature Society in Evansville Indiana. John’s wife Karin is the librarian at Hamilton Southeastern High School. He has two sons, both having graduated from Carmel High School. His youngest son, Adam, is pursuing a degree in Informatics at IU. His oldest son, Josh, graduated from IU with a double major in physics and math. Josh is currently a Physics PhD candidate at University of Michigan. John’s leisure time is spent gardening, hiking, and beekeeping.